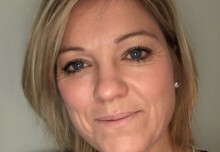 Johnsons of Whixley, one of the largest commercial nurseries in the UK, has teamed up with award-winning landscaping firm, Ground Control Ltd, to supply and install festive foliage to Spinningfields, Manchester. Spinningfields is one of Europe’s most successful urban regeneration projects. Home to over 165 world class financial and commercial service organisations, Spinningfields is a vibrant destination with luxury international fashion brands, bars and restaurants such as Mulberry, Tattu and The Ivy. 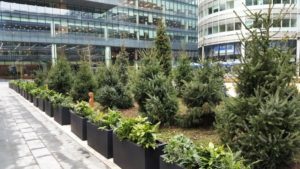 North Yorkshire-based Johnsons’ supply of Christmas trees to Spinningfields via Ground Control Ltd, included 50 Picea Omorika (commonly known as Serbian spruce) – a medium-sized evergreen tree frequently used at Christmas because of its striking crown. These trees were a beautiful addition to Hardman Square and installed prior to The Ivy’s launch on November 27.